Scena54 is an elegant cocktail bar, which is a unique proposition for guests over 30. Subtly referring to the legacy of the famous New York Studio 54, it offers a rich entertainment and cultural program. 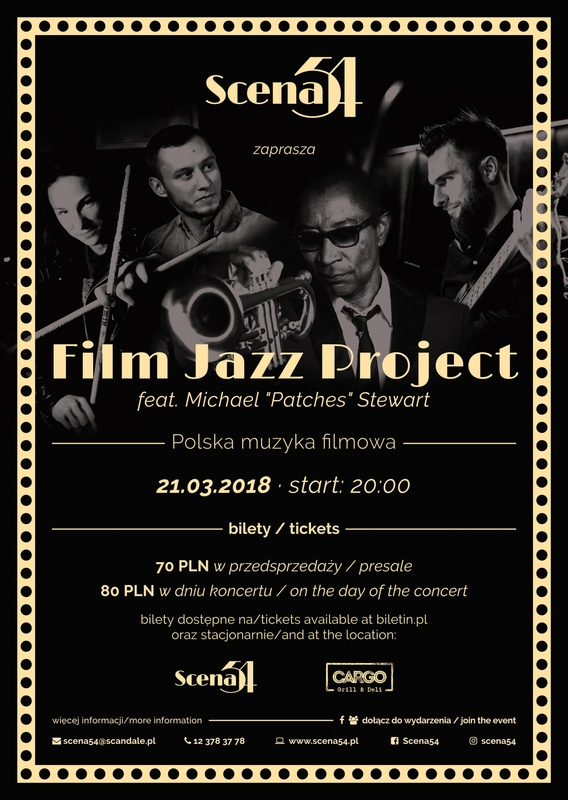 On Wednesday 21st March Scena54 invites you to an exceptional event - that day will take place the concert in which prominent jazz musicians will undertake the interpretation of Polish film music in a new, intriguing jazz arrangement. 'Film Jazz Project - Foreign Artists play Polish film music' is an idea that was created in 2012 at the initiative of Dominik Jastrzębski and Michał Czekała. During this time, they cooperated with the project, among others Michael 'Patches' Stewart, Derrick McKenzie, Nathan Williams, Frank Parker Jr., Femi Temowo, Luis Nubiola and many great Polish musicians. The Jazz Project film focuses on the promotion of young Polish artists who, thanks to their cooperation with well-known foreign musicians, derive knowledge and experience inspiring in their further musical career. The Jazz Project film presents its own original and unprecedented view of the interesting, and often underrated, part of the Polish musical heritage, which is Polish film music. It is also a chance to present the achievements of Polish compositions to the world. In the program, new arrangements of topics, among others from the films 'Janosik', 'Czterej Pancerni i pies', '07 report 'or' Law and Fist '. The concert is a great opportunity for all who love Polish movies and series. New, refreshed versions of well-known hits sound very interesting, and spiced up with the American color of the trumpet is often better than originals.